Lascaux's Gesso and Primer can be used by themselves, or together in a unified support system. In the Swiss tradition of exacting quality, they are made to the uncompromising specifications and standards of European conservators. Primer — It is suitable for almost any support or surface, including paper, cardboard, canvas, textiles, wood, fiber boards, concrete, and plastic. Use it as a primer for acrylics, oils, tempera, and murals. This fast drying primer is elastic and resists aging. It features a bright white matte surface that is smoother than Lascaux Gesso. Coated fabrics are flexible and can be rolled. 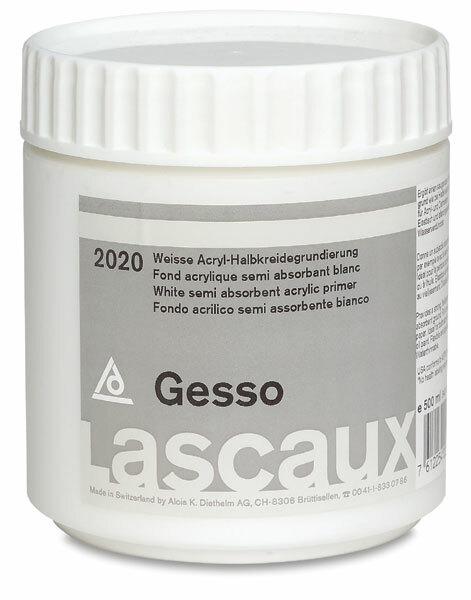 Gesso — Lascaux's Gesso is a versatile and semi-absorbent canvas primer that can keep everybody happy — including oil, tempera, and acrylic painters. It delivers the same archival characteristics as Lascaux Primer, while providing additional tooth and absorbency. It's a great choice for oil painters seeking an oil ground feel in an acrylic primer. Coated fabrics can be rolled for easy transport. Surfaces must be sized before priming.